It’s the 30th birthday of the Mac this year, and Apple has prepared a new iMac to celebrate the occasion: the new 27-inch iMac with Retina 5K display. The new Mac computer is part of the continued march of Retina technology. As Phil Schiller put it on stage, there has “never been a desktop display like this.” It features a 5120×2880 display packing 14.7 million pixels, making it the world’s highest-resolution display, a 5K display. The new iMac with Retina display has 7 times more pixels than the HDTV and 67% more pixels than 4K. In terms of tech specs, it incorporates a 3.5GHz quad-core Intel Core i5 processor with Turbo Boost speeds of up to 3.9GHz, and it can also be configured with a 4GHz quad-core Intel Core i7 processor with Turbo Boost speeds of up to 4.4GHz. Every new iMac with Retina 5K display also comes with AMD Radeon R9 M290X graphics, 8GB of RAM and a 1TB Fusion Drive for the first time. 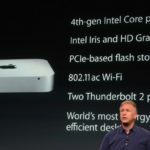 It can also be configured with up to 32GB of RAM, a 3TB Fusion Drive, or up to 1TB of super-fast, PCIe-based flash storage. 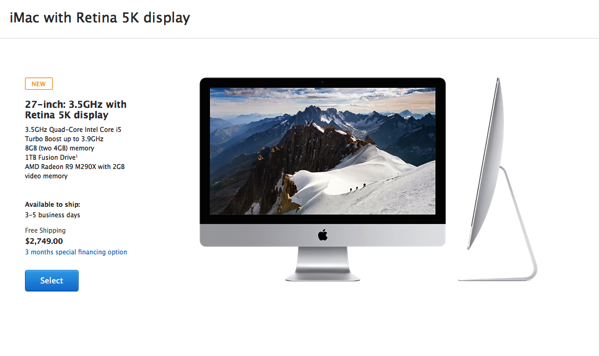 The 27-inch iMac with Retina 5K display comes with two Thunderbolt 2 ports. The display of the Retina iMac uses a TFT-based panel and highly efficient LEDs and organic passivation to improve image quality, which will also reduce power consumption by 30%. Of course, the new iMac comes with Yosemite. In terms of pricing, you can have it for a starting price of $2,749 (CAD), and it is shipping in 3-5 business days.